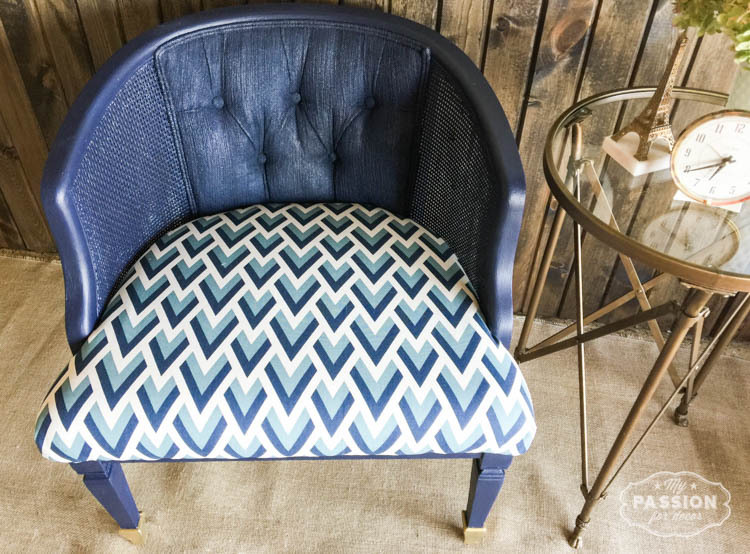 My Passion For Decor: September FFFC Geometric Design...Don't upholster, Paint! 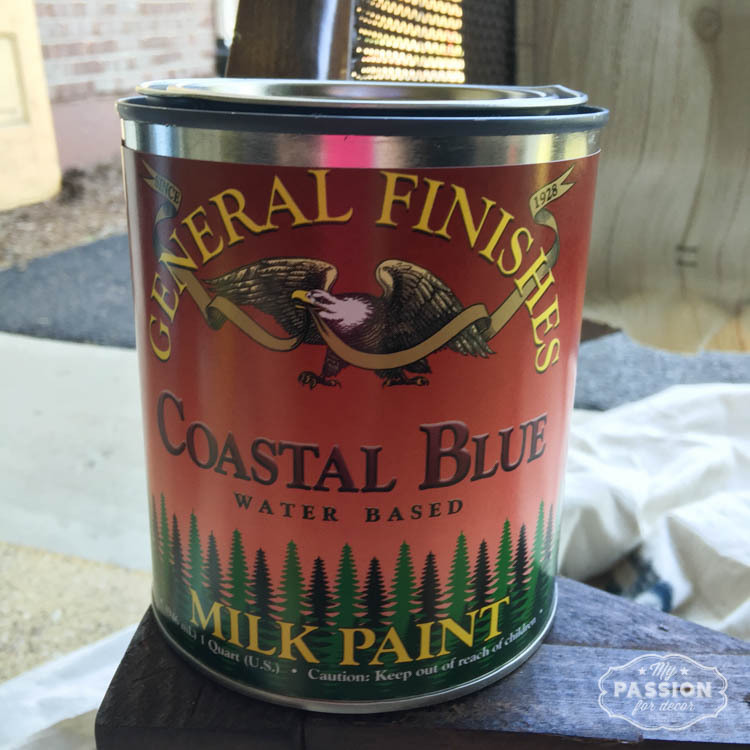 For the challenge this month, we were given a quart of paint from one of my favorite paint companies, General Finishes. They have a wonderful selection of water based milk paints in great colors as well as their fabulous gel stain. If you haven't tried their products...You need to!!! For this project I chose Coastal Blue. 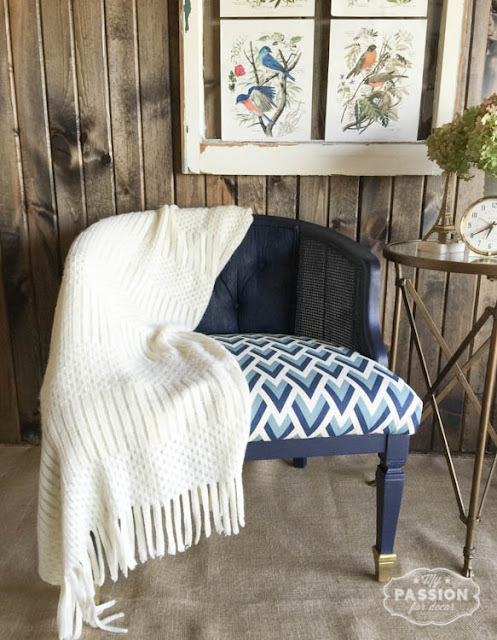 I think everyone knows I love a good navy blue and this color is a deep and beautiful navy! This is what I started with. A chair I found at Goodwill that needed some serious help. The upholstery was stained and a bit too '90s for me! I took the seat off, there were screws underneath so it was easy to remove, then I vacuumed and cleaned the chair. 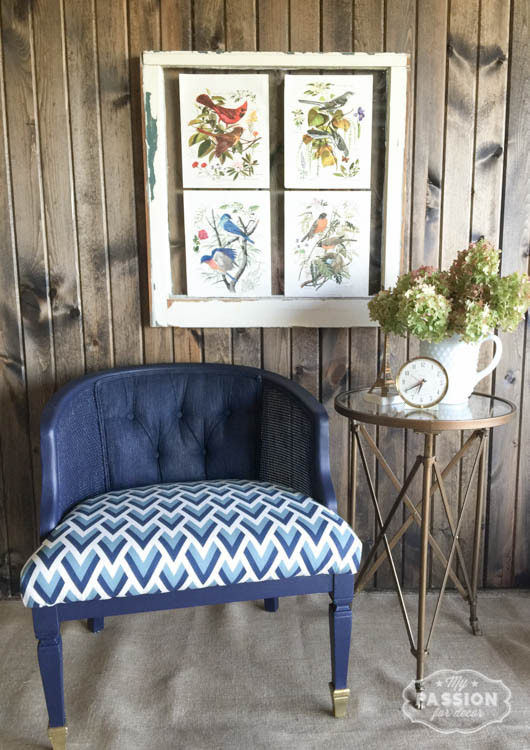 For my next step I used a product made exclusively for painting fabric. It's a sealer that you put on before and after painting. I painted the sealer on, the let it dry for 24 hours. I was so excited to start painting! I took my brush and made sure I got the paint in all the cracks and crevices. As you can see there were lots!! 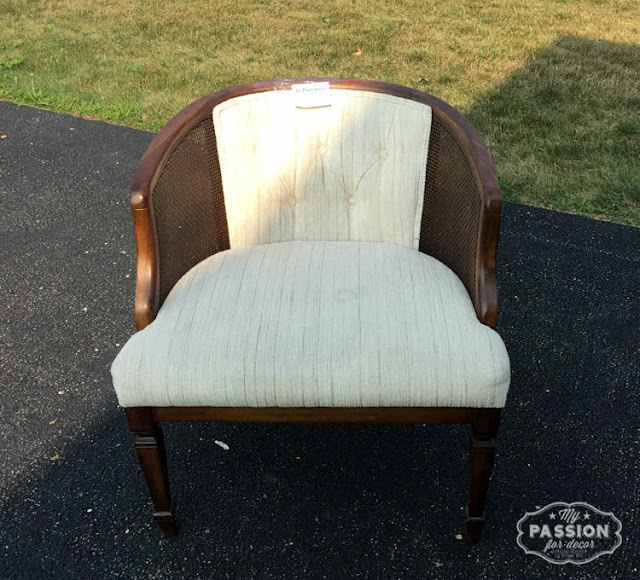 The paint is a nice consistency and was easy to get in all those creases from the tufting. Here's the back of the chair painted and drying. I did two coats and let it dry overnight. I also sanded in-between each coat. 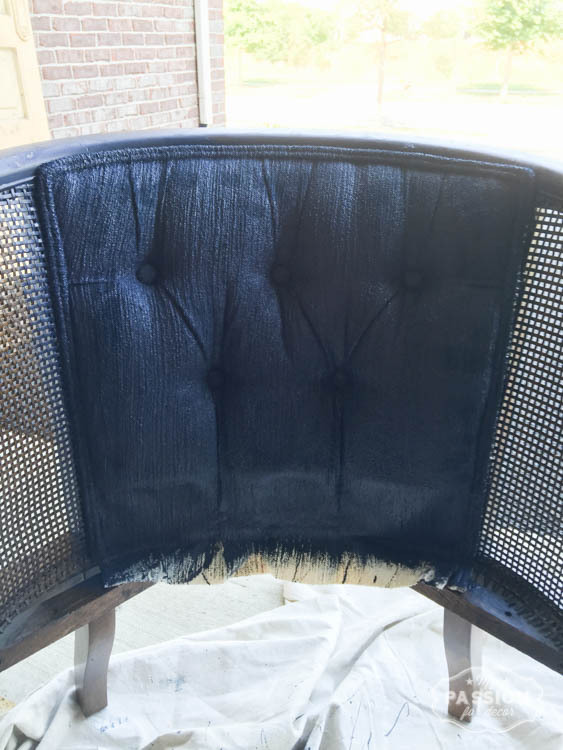 The last step was to seal the painted fabric. 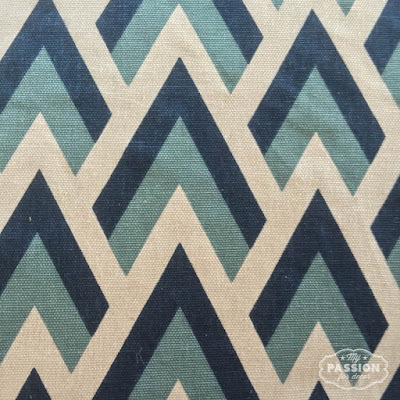 Isn't the Coastal Blue a gorgeous color!? 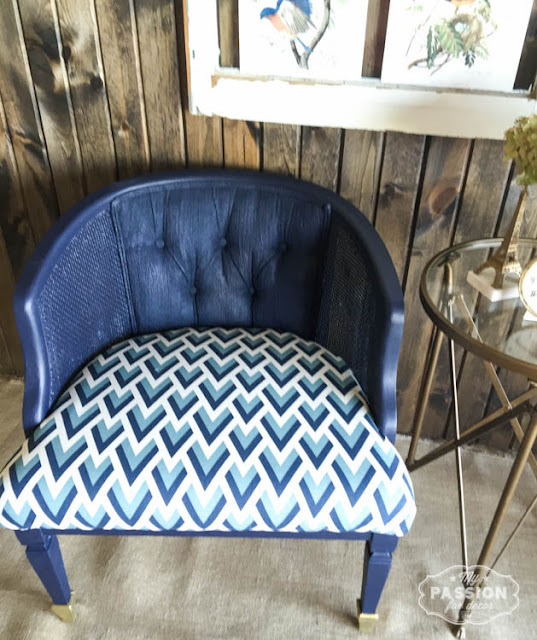 The easy part of the chair makeover was upholstering the seat. I fell in love with this fabric as soon as I saw it! My other geometric element is the caning on the seat. It worked out perectly! I added new batting and then stapled it all to the underside of the chair. Reattached the seat and that was it! For a final touch, I added some gold paint to the bottom of the front legs. This is after one coat. 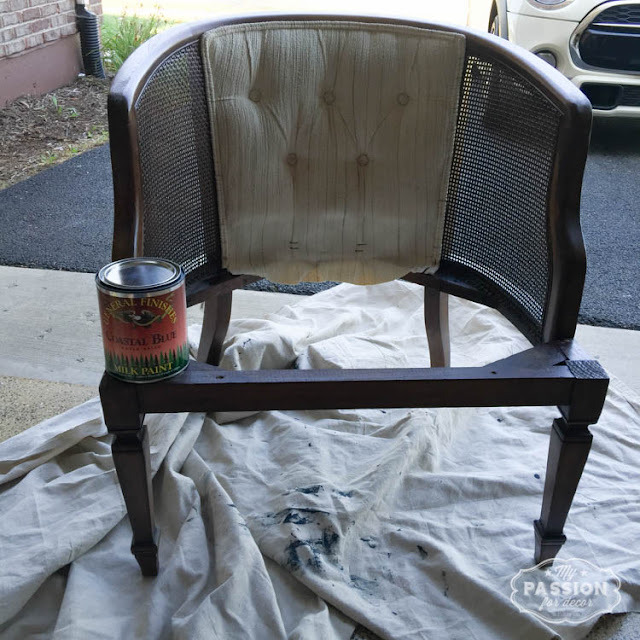 It took about three coats to get the color just right. 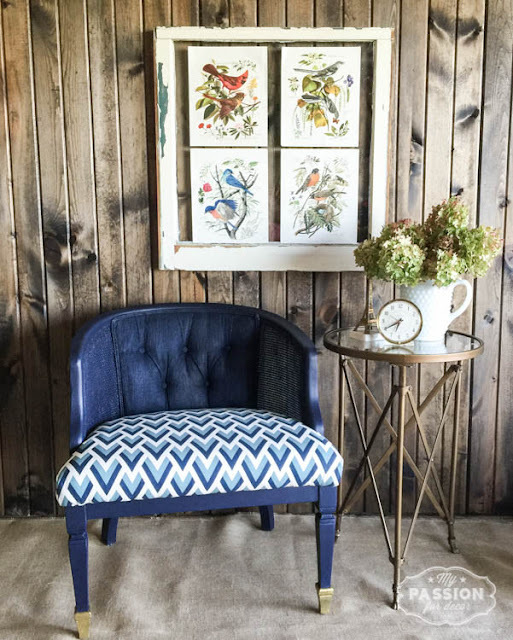 What was the best part of this makeover? The fact I didn't have to wax the paint!! This paint has a nice finish and sheen and doesn't require waxing. Thats a HUGE bonus in my book. This is how the chair looks now. I love how it turned out!! 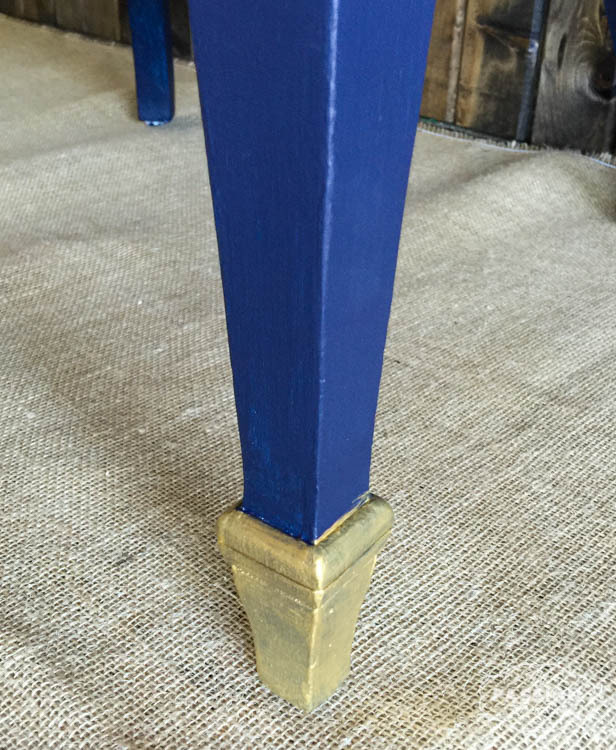 The Coastal Blue paint works perfectly with the geometric fabric and gold touches on the feet! I'll definitely paint fabric again and I'll for sure use General Finishes paint and stain again!! 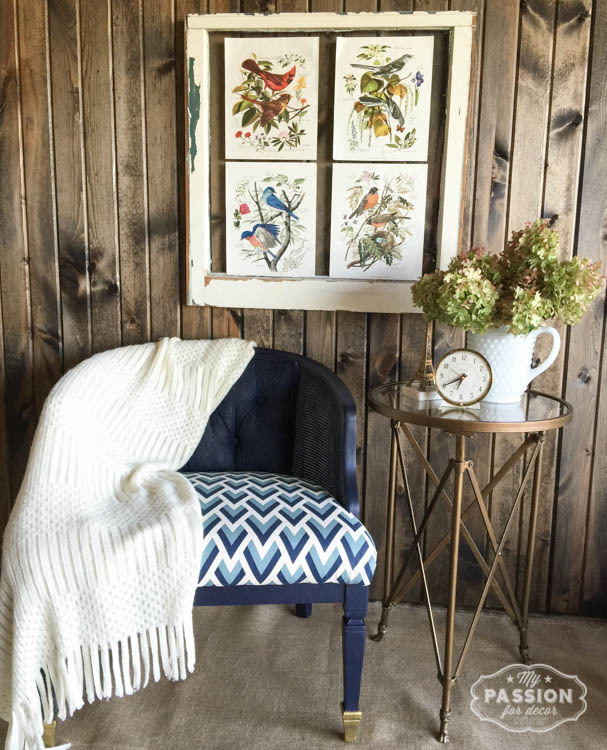 Have you ever painted fabric? If so, what was your experience and what process did you use? I want to thank General Finishes for the paint as well as our hosts for this months contest Lynn of Fern Avenue and Carrie of Thirty Eight Street. 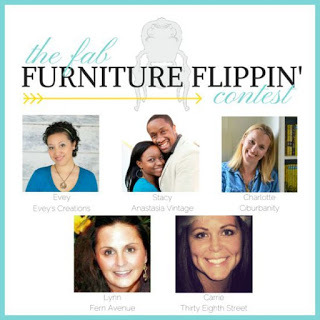 The Fab Furniture Flippin' Contest is open only to the entrants who have signed up through the groupFacebook page. If you are an active, furniture flippin' blogger, and you'd like to participate in future contests, we'd love to have you! Please contact us at info@fabfurnitureflippincontest.com to find out how! I was compensated for this post with product, but I'd never recommend a product unless I loved it! The design and project are solely my own. oh my gosh..I almost bought the same fabric!!! I love this..I need to get some of that sealer. I see these chairs all the time and pass them up cause I don't want to have to do the backs. 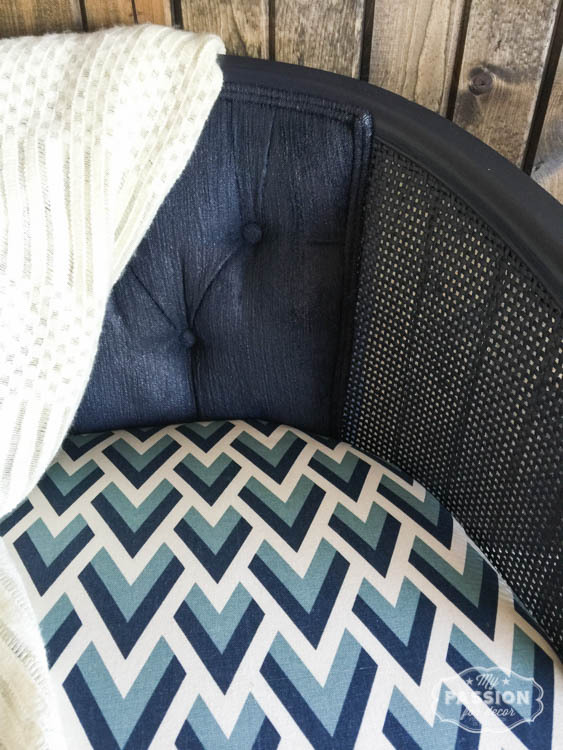 That fabric choice is a perfect marriage with the coastal blue, I am so gushing over this color. I simply must create something in this hue very soon! Very pretty! I love that blue!! The chair turned out great! 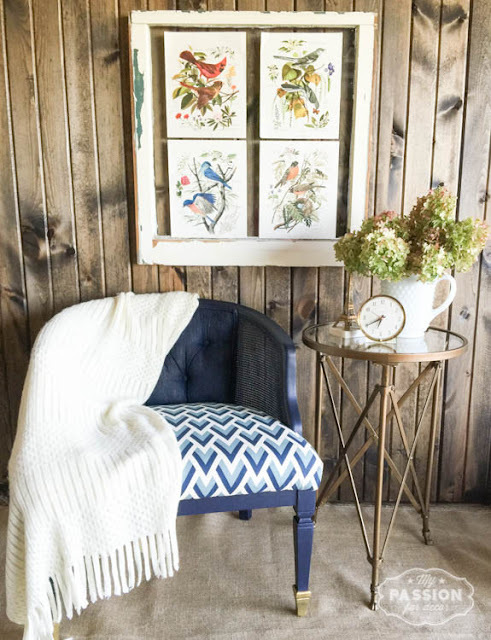 I have painted fabric with milk paint and I loved it. That blue - every time I see a project done with it I think I should use it. It's so pretty. Looks great! 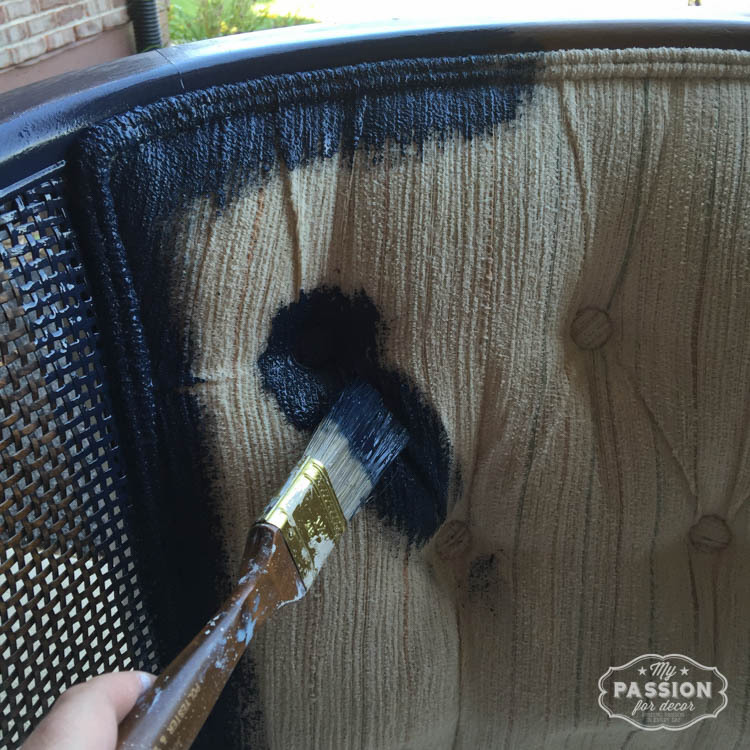 So, you used the same paint on the chair as you did on the fabric? 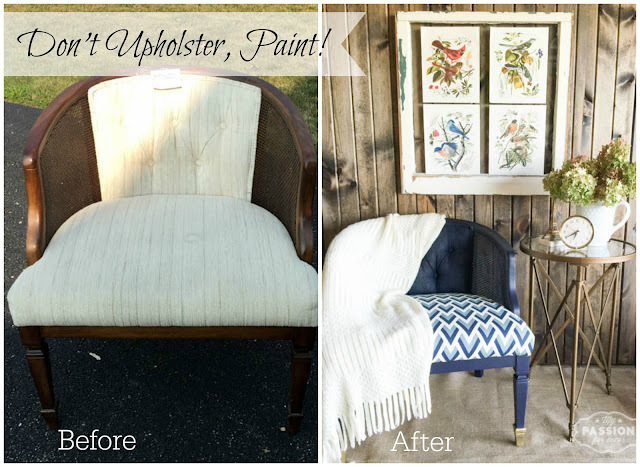 Or is the product you used to paint the fabric different? If so, can you provide the name? Thanks! You make magic happen with each piece you touch. Genuinely gorgeous.